I wrote a piece last month explaining how the payment card industry works. I talked about the various actors (acquirers, issuers, schemes, merchants, etc) and pointed out how weird it is that everybody knows the Mastercard and Visa brand names yet nobody actually has a relationship with them. One of the questions I didn’t address there was fees. Who makes all the money? Why does it seem so expensive? The four-party model: Merchants obtain card processing services from Acquirers, who route transactions via Schemes to Issuers, who debit Consumers’ accounts. Issuers are banks and other card firms (e.g. Bank of America, Capital One, etc). They usually employ the services of specialist issuer processors such as TSYS. (And, of course, some firms are active in multiple categories.) In the UK, Barclaycard is a notable example of a firm which is both an issuer and an acquirer and which does its own processing. The key point is that one firm from each category is going to be involved in every payment card transaction. So it’s interesting to ask: how much do they get paid? Let’s imagine I’m using a Visa Debit card, issued by a US bank (let’s say Bank of America) to buy $100 of goods from an online retailer. What happens? From my perspective, of course, it’s obvious: I’m paying $100! Imagine I am using my Visa Debit Card, issued by Bank of America to pay for $100 goods from an online retailer. Many readers will be thinking that seems low but let’s go with it for now. Merchant receives $97.76 from the $100 transaction. Elavon gets $2.24. But how is the $2.24 distributed between the acquirer, issuer and scheme? So we know how much money the merchant has paid to the “credit card industry”. But how is that money allocated between all the participants? Visa Inc has a very helpful document on their website, which tells us part of the story: Visa U.S.A. Interchange Reimbursement Fees. So let’s just pick a simple example. We’ll go with page 2 – “CPS/e-Commerce Basic, Debit” (Card not present). Aside: CPS means that the merchant has complied with various Visa rules (such as validating customer address to reduce fraud risk, etc) and has thus qualified for a low cost option. And we already know that the merchant only gets $97.76 of that money (their merchant discount fee was $2.24, remember?). So that means there is 44c left to share between Visa and Elavon. So how is the remaining 44c allocated? We’ve assumed the switch is Visa so we need to know much they charge. CardFellow.com has a good explanation. Visa assessment is 0.11% so Visa charges 11c. So there is $98.09 to pass on to the acquirer. And if there is $98.09 to pass on to the acquirer and we know that the merchant receives $97.76, that must mean there is 33c left for Elavon. The switching companies and the acquirers may earn the least fees per transaction but they deal with multiple issuers. If we take a look at the market fees earned they are likely earn way more than any single issuer. @Olajide – thanks for the comment. You’re right – I should have made that much clearer. I was trying to make the point that per-transaction fees levied by the Schemes and Acquirers are pretty low — but, as you rightly say, it’s the sheer *volume* of transactions (flowing over what are effectively fixed-cost infrastructures) that drive their profits. I’ll update the article to make his clearer. – the second is that this picture is incomplete without a picture of who is carrying the risk/liability (both fraud and settlement) for the transaction and some of the costs/trade-offs inherent in reversing a transaction. The trade off between the fee-based “cost” of the transaction and the cost of the fraud (both financial and operational) is an essential part of decision making among the most savvy participants in the industry (eg Amazon) and helps explain some of the different attitudes to fraud (eg US vs Europe) and the business models of many new entrants. @paymentality – thanks for the detailed feedback. very fair comments – and thanks for the insight re the subtlelty of pricing. I’m confused: are you using “Switch” and “Scheme” to mean the same thing? If so, could you just use one term? If not, what’s the difference between the two? @msallin – good question. You’re right… I was loose with my terms there. By “scheme”, I mean the overall bundle of services, rules, technology, etc., that a provider like Mastercard provides (e.g. the rule-book, brand, technical infrastructure, contracts, etc). By switch, I mean the piece of infrastructure that routes messages/transactions between participants in the ecosystem. So you can think of the switch as one of the services that a scheme provides to its members. However, I was vague on this point and did use the terms interchangeably…. when I should have been more precise. Thanks for the question. Ok, with that in mind, is it the Switch that takes 11¢ or the Scheme that takes 11¢? I’m asking because I’m going to be talking to banking industry folks and I want to get my terminology right, thanks! @msallin – the scheme is the legal entity/company…. the switch is something they run (or something they do, depending on your viewpoint, I guess). So it’s Visa who receives the 11c or 12c or whatever…. so I guess it makes most sense to say that the money is paid to the scheme. 2. The “inter-bank” processor which generally performs two tasks – switching/authorisation and clearing/settlement – as well as additional value-added services (risk scoring, etc). Oftentimes, these roles are fulfilled by the same entity (Visa, Mastercard, etc) but they can be performed by separate entities, hence the European Comission’s regulatory focus on separation of scheme and processing. The schemes/processors also charge additional fees for x-border/multi-currency transactions. I hope that helps clarify, at least at a high level, the (subtle) differences between Scheme and Inter-bank Switch/Processor and the related fee-profiles. The actual pricing ‘tables’ are substantially more complex!! @paymentality – brilliant – thanks Mark. It’s this sort of discussion from which I learn so much. 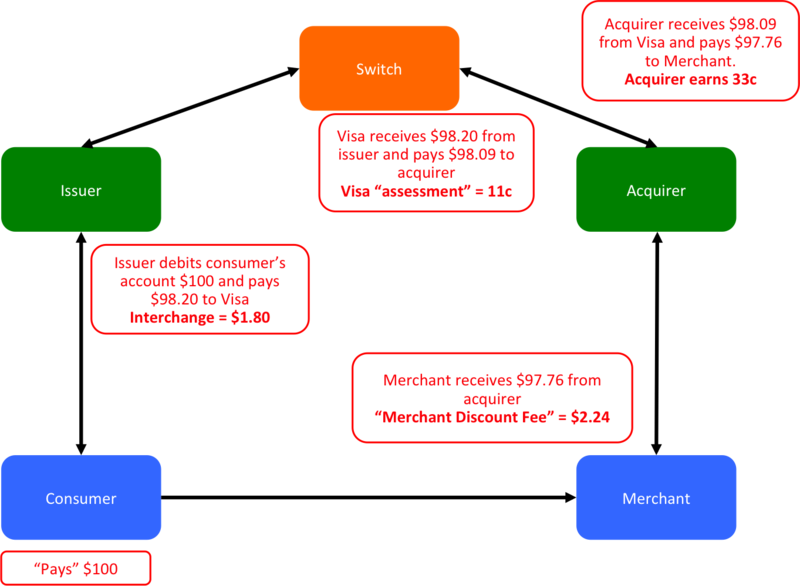 Hi Richard, I am bit new to cards industry, Can you please explain how this picture will work in case of ON US transactions and is there any need to go for the switch in ON US case(i.e both acquirer and issuer are same). Good day everyone,my name is Guage from USA i am here to testify about how i got a real and working blank ATM card from a good hacker on the internet, i was very poor before and i have been unemployed since 2010, i came across a post on the internet concerning the blank ATM card and i decided to give it a try,i agreed to the terms and conditions to receive the card. it worked like magic when i received this card and i was able to withdraw 5000$ daily with this card, i have a car of my own now and i have gotten a house too. i post this here because i know you can also be favoured by this testimony. I got a blank ATM card in less than 3 days from (atm1eng@gmail.com), i can now withdraw $4,000 daily, He is a genuine Hacker contact him or text him via mobile + 1 617 934 1393 and have yours today…..
Worldwide. CAN I USE THIS READY MADE ATM CARD TO BUY STUFF IN STORES? OR ONLINE SHOPPING? PAY BILLS? Yes, with this physical ATM card, you can use it to pay stuff at stores through POS. With this ATM card information, you can use it online to pay bills or do online shopping. When you order for this card, Full information about the card will be given to you. We also reload your card when funds is exhausted. My name is Rita i’m here to testify about gibatmfirm@gmail.com. I was very poor before and have no job.I saw so many testimony about how Mr Gib send them the ATM blank card and use it to collect money in any ATM machine and become rich. I email him also and he sent me the blank card. I have use it to get 700.000 dollars. withdraw the maximum of $ 5000 daily. Meyer is giving out the card just to help the poor. Hack and take money directly from any ATM f.Machine Vault with the use of ATM Programmed Card which runs in automatic mode. email (gibatmfirm@gmail.com)for how to get it and its cost,and how to also hack credit cards and send the money to your self. my name is ruth from USA, i have been so poor and could not get any lender to give me a loan, but i was able to get a particular card online from Mr Charles, with this card i am able to withdraw 3000$ daily from any ATM machine in my area, this card is linked to a charity account and this have really helped me alot. Hello Guys,This is a Life Time transformation !! !I have being hearing about this blank ATM card for a while and i never really paid any interest to it because of my doubts. Until now i discovered a hacking lady called Annie . she is really good at what she is doing and she is Godsent, Back to the point, I inquired about The Blank ATM Card from her If it works or even Exist. she told me Yes and that its a card programmed for random money withdraws without being noticed and can also be used for free online purchases of any kind. This was shocking and i still had my doubts. Then i gave it a try and asked for the card and agreed to their terms and conditions. praying and hoping it was not a scam i used the blank CARD and it was successful i withdraw nothing less than 8,000 dollar daily the blank CARD worked like a magic and now i have am rich and famous in my society,im grateful to Annie because she changed my story all of a sudden,The card works in all countries except Philippines, Mali and Nigeria. Annie’s email address is anniemellor2333@yahoo.com..
Hello Guys,This is a Life Time transformation !! !I have being hearing about this blank ATM card for a while and i never really paid any interest to it because of my doubts. Until now i discovered a hacking lady called Annie . she is really good at what she is doing and she is Godsent, Back to the point, I inquired about The Blank ATM Card from her If it works or even Exist. she told me Yes and that its a card programmed for random money withdraws without being noticed and can also be used for free online purchases of any kind. This was shocking and i still had my doubts. Then i gave it a try and asked for the card and agreed to their terms and conditions. praying and hoping it was not a scam i used the blank CARD and it was successful i withdraw nothing less than 8,000 dollar daily the blank CARD worked like a magic and now i have am rich and famous in my society,im grateful to Annie because she changed my story all of a sudden,The card works in all countries except Philippines, Mali and Nigeria. Annie’s email address is anniemellor2333@yahoo.com. I have tried a couple of these guys and have been scammed by them. I have lost money to them. It would be nice to find someone who is real instead of people who are out to take my money. Guess I am the dumb on for falling for it. Very good article indeed!! My question is about processing fee which schemes charge. Do they charge some % of transaction amount (per transaction) or based on volume of transactions? GOOD CARD WITH COOL CASH…Get THE 2017 BLANK ATM Programmed Card and cash money directly in any ATM Machine around you. There is no risk of being caught, because the card has been programmed in such a way that it´s not traceable, it also has a technique that makes it impossible for the CCTV to detect you and you can only withdraw a total amount of $5,000.00 USD in a day. Now email us today at our E-mail address at: Atmcardcashmachine@gmail.com and get your card today and live that luxury life you every dream to live. Get the best celebration ever with our 2017 BLANK ATM Programmed Card and cash money directly in any ATM Machine around you., There is no risk of being caught, because the card has been programmed in such a way that it´s not traceable. We give out THE Blank ATM Card. Do you want to live a good life thought its illegal, its the easiest way to be a millionaire. it also has a technique that makes it impossible for the CCTV to detect you and you can only withdraw a total amount of $5,000.00 USD in a day. Now email us today at our E-mail address at: blankatmcardmachine@gmail.com Get your card today and live that luxury life you always dream to live…..
Canada American Professional Hacker is Here Now !!!!! I’m Pristine Joe popularly known as trusted hacker, well basically i perform all sort of hacks and penetration into any and i mean literarilly any database. Hack facebook ? Hack email? change school grades? Hack Visichat Room ? Hack Flash Chat Room ? Hack Ftp User & Pass ? Hack Database ? Hack Yahoo Mail ? Hack Gmail Id ? Hack Websites ? Hack Face Book Account ? hack Vb Forum ? Hack WordPress Blog? hack C C any country ? hack moneybooker ACCOUNT ? hack liberty Reverse Account ? hack paypal Account ? Root server ? bypass Google phone verification ? Install Red5 On linux server ? Hash Crack ? Hack Bank Account ? Ddos Service ? hack twitter? erase criminal records? for any sevices you want contact pjautoatmworld@outlook.com OR CALL +15184181921. for services delivery in full assurance and 100% guarantee. What’s up,I log on to your blogs named “A simple explanation of fees in the payment card industry | Richard Gendal Brown” on a regular basis.Your humoristic style is witty, keep doing what you’re doing! And you can look our website about proxy list. Get a blankatmcard that can withdraw $5,500 USD every day, for six months! HOW I HOT FAVOURED WITH THE HELP OF A BLANK ATM CARD INSTEAD OF A LOAN!!! I have been so poor and sick before, but now i am rich and healthy i got a master card from my friend on the internet and this card is loaded with money with this card i am able to collect $5000 per day, i collect my card last week and my friend still have many of this card and if you are poor and you need help you can get this card To get this card contact email and you will have your card. last week and now I have withdrawn about $43,500 for free. PLEASE READ! !Hello Guys!! !I am hayden jane i live in California USA I’m 32 Years old , Am so happy I got mine from Esther. My blank ATM card can withdraw $4,000 daily. I got it from Her last week and now I have $12,000 for free. The blank ATM withdraws money from any ATM machines and there is no name on it because it is blank just your PIN will be on it , it is not traceable and now i have money for business,shopping and enough money for me and my family to live on .I am really glad and happy i met Esther because i met Five persons before her and they took my money not knowing that they were scams. But am happy now. Esther sent the card through DHL and i got it in two days. Get your own card from her right now she is not like other scammer pretending to have the Blank ATM card,She is giving it out for free to help people even if it is illegal but it helps a lot and no one ever gets caught or traced . im happy and grateful to Esther because she changed my story all of a sudden . The card works in all countries that is the good news Esther’s email address is estherhadas339@yahoo.com,. month. WorldblankatmSolution? are real because I got my? This message is not for everybody only saying this to those who might need this, yes most comments on these sites are scams but i know someone will come across this comment and wont fall victim to these scams, i pray someone sees this. He worked for me and at the same time my personal counselor and i can confide in him, from what i observed his clients privacy is his first priority. To cut to the chase, he renders a good number of hack services, needless i mention them, reach him through the email below. I got my already programmed and blanked ATMcard to withdraw the maximum of $2,500 daily for a maximum of 1 year. I am so happy about this because i got mine last month I have used it to get $30,000. Mrs Christy is giving out the card just to help the poor and needy though it is illegal but it is something nice . And no one gets caught when using the card. Once again I want to give thanks and appreciate Mr Michael for the financial help with his blank atm card. It really work like a magic, I came across his contact on YouTube through Eldred talking about him how he helped him too. Today I’m a living testimony. Contact him now and get yours don’t be shy he is a good man with no tricks, he is good at his work, i fully recommend him to everyone one who is financially broke down or who need money to pay bills or start up business like me. His contact text or whatsapp him: +18508008129. Please follow me on Instagram:daneilpcha.Merry Christmas.